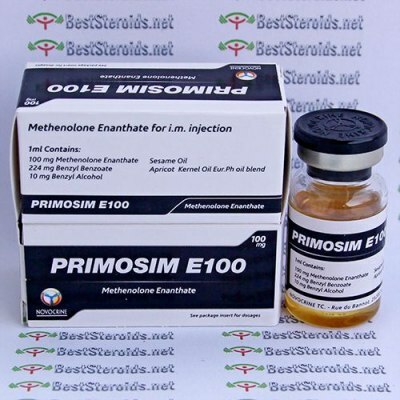 Primosim E100 (methenolone enanthate) is one of the safest steroids in use today. Users usually don't report huge gains but the great thing about Primosim is that the gains attained from it are basically permanent ones. It won't aromatize, it's not toxic, and it has low androgenic properties. Primosim is the only steroid that works well on a low calorie diet. Depending on your goals, it can be used effectively in combination with any steroid, and it does not effect natural testosterone production. Primosim is also commonly used to bridge between two stronger steroid cycles, to help preserve gains that were made. When somebody bridges, it means that they never completely quit taking steroids between cycles. Effective for bulking, but tends to harden and add muscle tone more that build big muscles. Primosim is great when added to a cycle (stacked) with other steroids, it tends to lessen water retention and harshness when stacked with more heavy-duty testosterone injectables like Omnadren/Sustanon 250 or test. cypionate/propionate. Just got another big order! On time, professionally packaged, and great product! I've been on Primo for a month now eod, and after a lengthy cycle of 1 gram of Sust a week, its like Primo took over where sust left off. Feel great, look awesome, added size. Primo and Turinabol and you have Arnolds cycle without the bloat!